This quickfire challange gave us the chance to reflect on our classroom and school community. I appreciated this experience, as my communication with parents is an area of opportunity. I update our class website weekly, yet parents rarely look to it. Using the online program Smore, we had 30 minutes to become familiar with the program and create a newsletter based on any interest. I chose digital citizenship for my topic, as a classmate and I had just completed an assignment on creating a special interest group for digital citizens in a 1:1 environment, SIG1to1DC. Click on the image below, to take you to the actual interactive newsletter. Today’s quickfire challenge involved (re)creating a learning space. 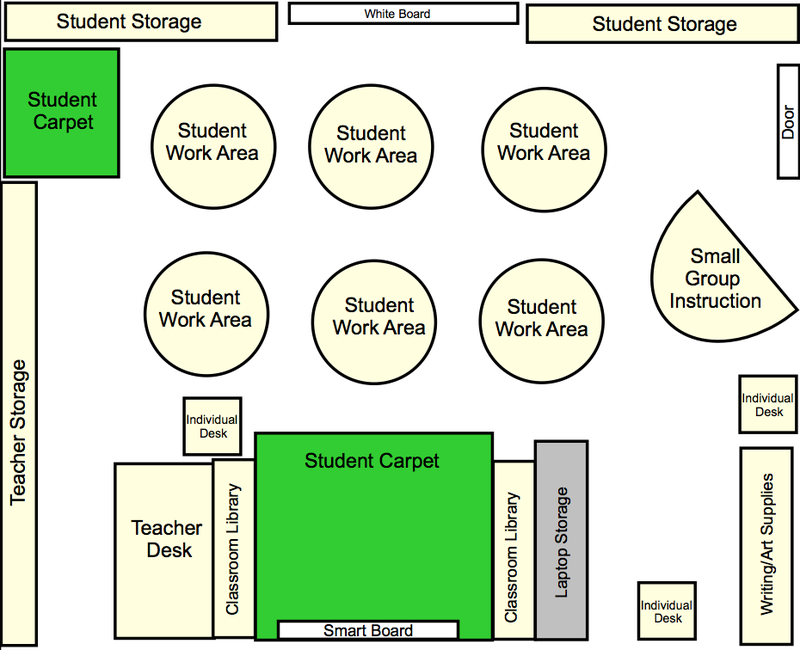 I chose my classroom as the space to redesign, as being surrounded by educational theories and practices lately, it seemed only natural to do so. After reading an excerpt from The Third Teacher (Cannon Design Inc., VS Furniture, & Bruce Mau Design., 2010), regarding the creation of learning spaces, this quote stuck with me in particular: “Consider a variety of learning spaces- spaces in diverse sizes, materials, and colors, as well as spaces with different transparency, connectivity, and agility. The one-size-fits-all idea really isn’t acceptable anymore.” This statement confirmed my feeling that my learning space isn’t too bad- considering the physical parameters and resources available. The large carpet area serves several needs. It is used for whole group instruction, where students sit beside learning partners and collaborate on ideas. 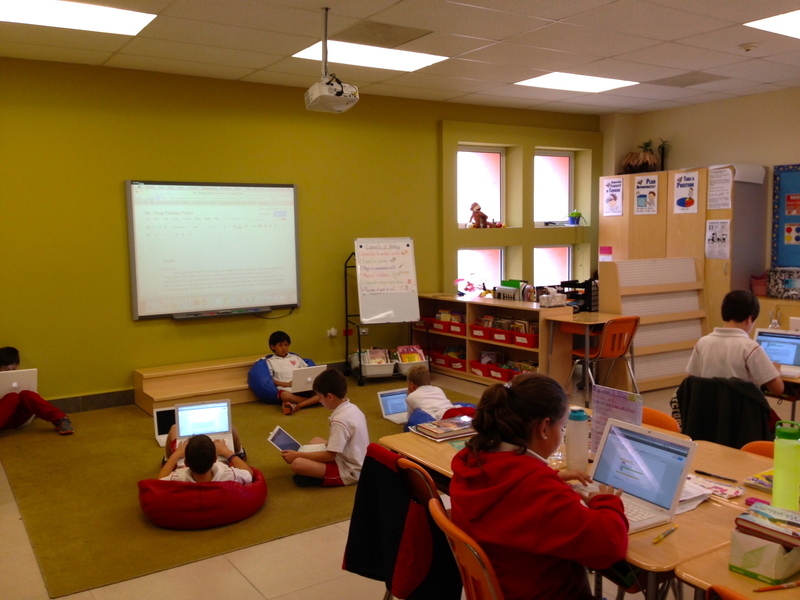 A large amount of independent work and reading is done in this area on bean bags- as is small group work. Morning meetings and class discussions also occur on the carpet. The U-shaped table is intended for small group instruction, and is also a favorite location for students to work independently or with a partner, away from the crowd. 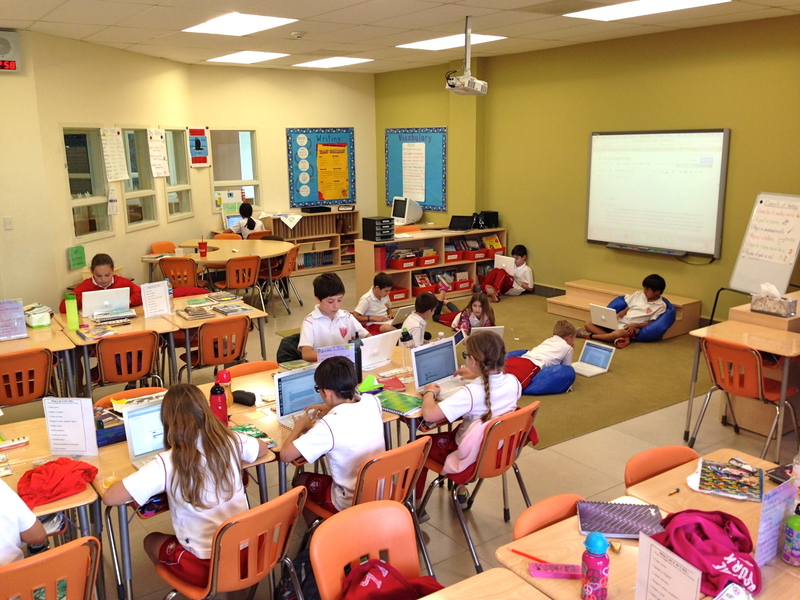 Throughout the classroom there are multiple independent desks, where students elect to work for a more formal environment and away from distractions. There are three rows of eight student desks, where they keep supplies, and often collaborate together on multi-disciplinary learning objectives. In addition to the desks, students also have a storage area, or cubby, to keep additional art, music, P.E., and school supplies. Below I have created a design for how I feel the space may be improved. One large constraint that I cannot seem to get around, is the limited area for student work to be displayed. This is made difficult, as school policy prevents teachers from taping anything to the walls. Some student work is displayed on bulletin boards over the teacher storage area and above the writing/art supplies. However, other than those locations, space is limited due to the height of student storage areas and windows (which cannot be covered). There is a bulletin board outside our classroom, but it is not easily accessible for students to actually make use of it. I am still working on this issue. Therefore, the biggest change I would like to try to implement is the use of round tables for student work spaces. The round table promotes student equality and collaboration- both of which are important in a learning space. While students will be able to work and share ideas, it is also possible for them to face forward in their chair and work independently. In addition, my fourth grade classroom will be receiving a cart containing a class set of laptops this year. The location for the cart is already determined, however I feel this provides another need for using round tables. As students are sliding laptops and notebooks back and forth, working independently or collaboratively, there will be a smooth, open surface with plenty of space, as opposed to the constraints of their rectangular desk. With the addition of these tables, I feel the classroom would be opened up a bit more, and provide multiple locations for any type of learning that will be happening in our fourth grade class. Create an infographic that is appealing and enlightening, explaining a learning theory- that was the challenge we faced today. We were given a bit more time than normal, so we would have time to choose a learning theory, research, and synthesize at least two resources of content for the graphic. Suggestions for creating the infographic were: easelly or infogr.am. I used easelly, and came up with what you see below. Click on the image to view a larger version. Today’s challenge involved remixing a video clip, but not just any video clip. We were to select a topic from a list of educational “buzz words,” to “create a one-minute or less remix that relays the essence of that buzzword to your audience.” I chose the idea of a “flipped classroom,” and searched for videos with creative commons via YouTube. Once I had a few videos I was interested in, it was time to piece together my remix. Today was by far the most challenging quickfire challenge, for me. We began by taking a look at 6 word memoirs, which I feel is a pretty great idea. Get to the point, and only include the most necessary items that represent you. It could be your whole life, it could be your weekend, it could be your walk to class. After reflecting for a brief period of time, I came up with my 6 word memoir, and it was time to put it into action with technology. This was the difficult part. We used Mozilla Thimble to edit/dabble in coding a template that had been created. This was all completely new to me, as I am accustomed to dragging and dropping or searching for alternative ways for inserting or editing media. While there were directions to follow, the learning curve here was a steep one. Other than embedding video into blogs or webpages, the coding language was completely new to me. This definitely made me reflect on the learning process for both my students and myself. I brought into this situation very little prior knowledge, which I’m not sure helped or hindered the challenge. I used my knowledge of Google and YouTube in search for how to upload an image, and while I had to take a photo with PhotoBooth, upload it to Flickr, copy the HTML code (with only specific text), and then paste it back into the Thimble code, the image did appear. Actually, writing this out does not make it sound too bad- but believe me, one added space or accidental quotation mark and that picture would not be there! I may now have more empathy for my students who enter some learning situations with no experience or background knowledge. They are just thrown into the learning environment and are expected to survive or succeed. There are times I allow students to become a tad frustrated before easing my way in to provide them with support, and there are moments I need to intervene before frustration arises. I noticed one of our professors did this today as well. He waited long enough for us to have a go independently (or asking neighbors), and then slowly made his way around to check on progress and guide us toward an answer. Anyhow, I definitely have respect for the creators of the easy to use programs like Glogster, where the coding is done for you, and the user’s job is made much easier. Below, you may click on the image to get a larger version of my 6 Word Memoir.